Stop here for a mature, concise and realistic guide to enlisting the aid of the Lwa, the ancestors and spirits of Voudou, to help you provide for your family’s survival. Filan takes great care to communicate the details of real Voudou practice, and makes it clear that such information is hard-won. For those with rigid ideas about “right” and “wrong” prepare to be uncomfortable. Voudoun might be classified by some as a “pagan” religion but it bears no resemblance to Wicca or Wicca’s similarly-shaped religious brethen. While most neopaganism has an element of transcending the commonplace, Voudon is a religion of the common person. Those who practice Voudou ask their spirits for things that some might find blunt, frightening or overtly sexual as a part of making money or having the food needed to survive. Filan takes great pains to establish an understanding of Voudon within Haiti’s historical context. The conditions he describes makes it clear why Voudon blurs moral boundaries as most people understand them. In the process, the author answers questions about paying for initiation and the nature of offering. Voudou Money Magic is rare in how deftly Filan handles practice, theory and background. 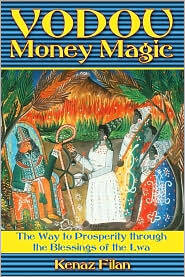 Filan weaves in sound thoughts on using magic for financial gain, carefully framing it from the Haitian perspective: Voudon won’t get you rich, quick. Instead, the spirits will help you solve your problems, and most of those solutions involve hard work. This is a refreshing change from books that either moralize at the reader for failing to transcend the desire for money, or that suggest that all needs may be met by wishing hard enough. The book also details with a great deal of care the waves of invasion that Haiti has experienced and how the damages of slavery still echo across daily life in the country. Voudon was a result of Haitians looking for a way to keep their souls, and because of vast poverty, war and natural disaster, there is nothing more important on the island than the soul and ancestry of its people. Filan shares ample notes on the practices and offerings in Voudou, but uses personal anecdotes sparingly. It’s very clear that the spirits will support their own – and anybody can join that club with proper offerings and respect. The communication from Ol’Harv, a house spirit connected to the author, instructing prostitutes on rituals to ensure their safety and success, is funny and yet strangely authentic. You can almost see the well-meaning old lecher leaning over a favorite lady of the night as he whispers his secrets in her ear. This book is an outstanding addition to any magical library, both for the good information and because the book is just a good read. Occult books that are both readable and educational are very rare, and right now anything that makes the culture and deep mindset of Haiti better understood by the world is a positive contribution to collective knowledge.